Life has been overly complex of late, too busy, too much tension. I'm late sitting down to write this, and because I haven't had time to think, I'm wondering, what am I going to write about. At times like this I tend to go back to basics and so I turn my mind to gratitude and generosity, and find myself transported to India two years ago. I was on pilgrimage with a party of thirty Europeans and Indians. Amongst the Indians was Kapil: shortish, mid-twenties, cheerful and energetic. We hit it off right away and spent much of the next three weeks hanging out together. After a few days drinking in the peace of Sarnath, site of the first Dharma teaching and the founding of the Buddhist Sangha, we decided to venture into Varanasi - a 20 minute auto-rickshaw ride away. We took in the sights, the markets, the ghats took a boat ride on the Ganga. Varanasi is a bustling city. It was an important economic centre even in the time of the Buddha, and these days is considered a holy place by Hindus. It cost us the grand sun of Rs75 for the auto into town, Rs75 was slightly less than one English pound. But trying to get a return ride we found that the price had doubled. Being decadent Westerners, most of our companions just stumped up and soon only Kapil and I were left wandering along the ranks of autos in the dark. Kapil was not going to be ripped off! He shopped around and found a driver who would take us for Rs75. Unfortunately the auto was extremely dilapidated, literally held together by string, and it was almost immediately apparent that it was much slower than anything else on the road. By the time we were on the outskirts of Varanasi the fog was coming down - it gets quite cold in northern India in mid-winter. Soon afterwards the headlamp of the auto faded, flickered and went out altogether. I'd seen enough of Indian driving and roads to be alarmed at the prospect of driving through a foggy night with no illumination. Thankfully we stopped. A bit of thumping and rattling got the lamp going again, but it was barely visible. Our 20 minute ride stretched out to almost an hour. By the time we got back to Sarnath I was cold, tired, and more than a little indignant. I paid the driver rather reluctantly, thinking that he had hardly earned it, and toyed with the idea of giving him less. And then Kapil did something which startled me. He got talking to the driver, invited him over to the cafe and bought him a cup of chai. I looked again at the driver. He was thin, ragged, and looked exhausted. Suddenly it dawned on me that the trip had been a bit of a nightmare for him as well, and that he wasn't looking forward to the return. It's a cliché but it's true that life is cheap in India. It's all too easy to fall by the wayside. Perhaps Kapil could relate to the plight of our auto driver because he himself had been born into the lowest strata of Indian Society. The hateful practice of untouchability was outlawed byIndia's first independent government, but Gandhi was no hero to the Dalits (oppressed) because he still believed in caste, still believed that a Hindu should follow his Dharma, or caste duty. It was the Dalit leader, Dr Ambedkar, and his followers who worked to benefit the Dalits. Kapil has opportunities today that his grandparents could never dream of, but upper caste Hindus still persecute Dalits in some places in India. But actually there is no excuse for my failure to empathise with my fellow human being. Kapil's background was closer to that of the driver, but I had been on that same journey. Yet could not imagine that my discomfort was shared by the driver. This is something I come back to and reflect on frequently. 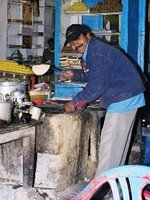 Kapil is poor, has an uncertain income in a place were there is no social welfare, and yet he could be kind and generous. He was grateful for the effort of the driver. Another time in Sarnath our café was struggling to keep up with all the orders, and so Kapil ducked out to the kitchen to help them. He did the same again in Kushnagar, and this time I managed to photograph him making chapattis for us (pic above). When I get too busy and self-centred, I try to think of Kapil and his plain and simple generosity. I'm his elder, and now I'm ordained and he is not; but he is my teacher. Jai Bhim Kapil. Monk or Layman or what?